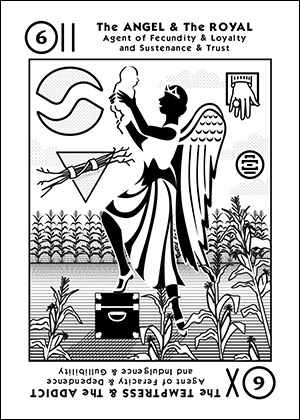 An Angel with infant in hands appreciates the progressive growth. Raise that child up! Maternal instincts are nurturing. That child will prosper with every advantage. Mother is devoted to child. Her loyalty is unquestioned. Don't test her tenacity. Her passion will be beneficial to all she helps. She is a good influence, that leads to good decisions. A Royal, cute and cuddly, gives so much. Maturing daily, it takes in the world. It is fortunate, with every advantage, to progress with passion into each day. It is charming. It will make a fine spouse to a lover, some day. Everyone will seek its charm. It will be faithful. This is a card for friendship and all the people who help us when we need a benefactor.